An all-over print 'I Loved You At Your Darkest' Behemoth t-shirt - tour edition. This version differs from the regular one because it does not have sewn tag - the size is printed in the inside, it also does not have the tape with Behemoth logo. 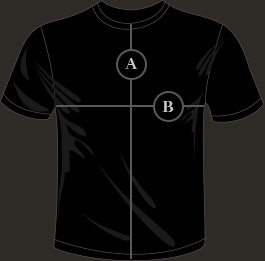 Besides these differences, it's the same t-shirt we have regularly in the store. The print is made with a sublimation technique, is impalpable and in full range of colours. In addition, some parts of the print (the gold elements) have been additionaly screen-printed which gives a fantastic effect. It also won't wash out. Look as if you had the painting printed on you. The material is of a high quality 50% polyester / 50% cotton 190g/m2 - polyester with the print on the outside and cotton layer on the inside - which makes the t-shirt wearing experience outstanding in comparison to other poliester-made t-shirts.